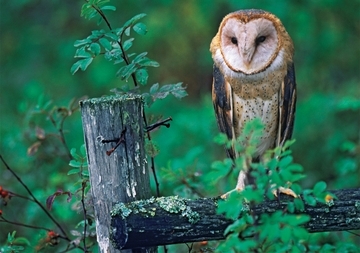 The barn owl (Tyto alba) enjoys a broader distribution than nearly any other land-dwelling bird. Barn owls are common throughout temperate North, Central, and South America; Europe, Arabia, and Africa (except for the Sahara); the Indian subcontinent and Southeast Asia; and Australia. They are rodent specialists (and in fact have been introduced in Hawaii for rodent control purposes) that breed with greater or lesser enthusiasm in response to local prey population changes. In a mouse- or gopher-heavy year, a pair may product two hatches of three to six young. The source of their name is obvious, but barn owls are willing to nest in any snug, undisturbed enclosure. Many farmers actively welcome them.